The Norwegian government built the Svalbard Global Seed Vault in 2008 to store seed samples of the world’s crops and plants. The vault serves as a natural deep freeze, and is meant to protect important genetic material in case of a major man-made or natural disaster. Svalbard was chosen as the site of the seed bank, in part, because of the area’s permafrost – a thick layer of soil that stays frozen throughout the year. It makes for excellent underground cold storage. Norway’s Agriculture Ministry said improvements to the vault will include a new entry tunnel. They also include construction of a service building for emergency power and cooling units and electrical equipment that might send heat through the tunnel. In this photo taken Sunday, Oct.18, 2015, rows of boxes containing seed samples sit inside the Global Seed Vault in Svalbard, Norway. Jon Georg Dale is Norway’s minister of agriculture and food. He announced the plans. He said they will help the vault continue to be a secure storage area. “It is a great and important task to safeguard all the genetic material that is crucial to global food security,” he said. 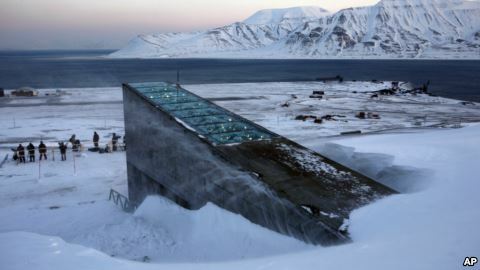 The Svalbard vault acts as a backup to many of the world’s seed banks. In 2015, researchers took out seeds from the vault to help build seed collections in Lebanon and Morocco. Those sites were set up to protect materials from an important seed bank in Aleppo, Syria, which was damaged by violence from the country’s civil war. Pete Musto adapted this story for VOA Learning English using Reuters news reports and other materials. Ashley Thompson was the editor. We want to hear from you. What other major plans do you think the world’s governments should make to prepare for huge disasters? Write to us in the Comments Section or on our Facebook page.